Garden walls built using Flemish bond are one bricks wide. As with any wall built of brick, no two adjacent vertical joints should be in line. 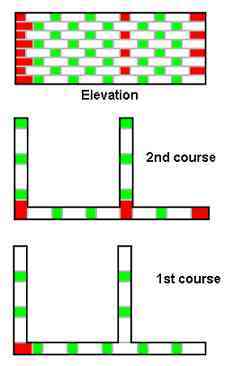 With a straight wall this is not a problem, just offset each course so that the header bricks are centred on the stretcher bricks on the course below. 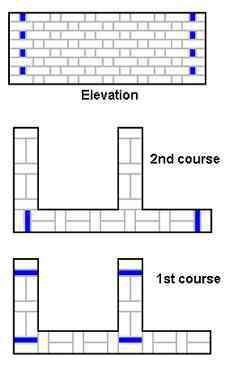 When turning a corner at the end of a straight run, a Queen Closer (coloured blue) is required on each course. Use Flemish bond for a half brick width wall can give a decorative finish but does require the use of quite a few half bats (coloured green) and three quarter bats (coloured red).